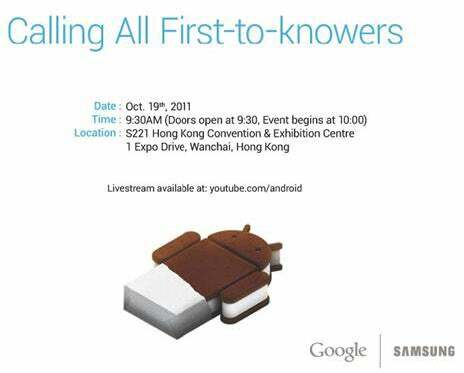 The Samsung/Google media event, which is rumored to launch the Nexus Galaxy with Ice Cream Sandwich, has been rescheduled to take place on October 19 in Hong Kong, China. The event starts at 10:00 a.m. HKT with doors opening at 9:30 a.m. The event will be livestreamed will be available at YouTube.com/Android at 10 p.m. EST on October 18 for those who cannot attend the event. Samsung and Google were supposed to hold the event two days ago at the CTIA show in San Diego. The official reason the companies gave for postponing the event was to respect Steve Jobs‘ passing. There are rumors, however, that the event was moved due to an unforeseen bug in the software. Either way, we’re glad that the launch is happening next week instead of being postponed even later. PCWorld will be covering the event remotely on Tuesday night so stay tuned.